That strange phrase woke me up one night. I had just suffered through a nightmare where a team of coworkers were arguing over a bullhorn, whether it should be red or white. A lot of money and time was going into that argument. And woke up with a jolt. Do you find yourself going down a path, stopping at a fork in the road, debating the decision, only to stop and ask if indeed you’re even on the right journey? 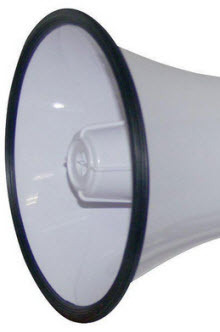 This innovation geewhizdom was inspired by a bullhorn. You’ve heard about product placements in TV and movies. Now check out proper product placement in social media and blogs. As one of thousands of volunteers for Junior Achievement, I receive a volunteer package with instructions, curriculum, classroom materials, and a few brand items. That includes this banner that volunteers hang in the classrooms. I happened to shoot a selfie holding the banner to include with other photos I submitted to Junior Achievement. Lo and behold. Junior Achievement used that photo in their Facebook post for National Volunteer Week. Facebook Post by Junior Achievement of Sacramento. I’m a closet perfectionist. It’s in my DNA. The danger of perfectionism is that nothing gets completed. Sure, I get work done, but that often leads to me tweaking and refining and perfecting and revising and reworking and never reaching the point where I am satisfied. Because I’m shooting for the perfect, when I should be shooting for the good. You should have seen how much angst I put myself through just getting this post started, written, and finished. Coaches often tell a player to “be the ball.” I heard that phrase as a beginning bowler from my bowling mentor. He said to “be the ball” in order to understand how I’d roll down the lane if given certain types of spin. In this latest album of photos, I was asked to shoot images of golfers. Having seen numerous golf shots of the same, boring image of foursomes lined up shoulder to shoulder (like fence posts), I decided to photograph the golfers from an entirely different angle and perspective. I decided to be the ball. Quick. What’s the one technology you can’t live without? Not a day goes by without you using it. I want to blog more. But instead of just thinking about it and saying it, I’m going to do it. I will post to my blog at least once a week for all of 2011. Now, I know why my blogging has tailed off in the past few years. When I first began blogging in 2004, there were fewer challengers to my time. But in the last few years, I’ve added social networking through Facebook, business networking through LinkedIn, microblogging through Twitter, and photoblogging through Tumblr. I’ve graduated from a simple cellphone to an iPhone with all its distractions. So, my blogging here dropped off. This year, I’m taking the WordPress challenge. I’m making use of WordPress’ The Daily Post to help me along the way. If I need help, I get to ask for it. If I can help someone else, I promise to volunteer. I hope you encourage me with comments and likes. Here’s to a new 2011.